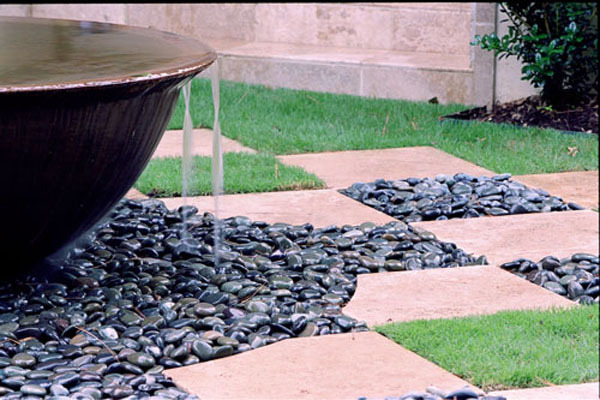 This fountain is a very classy contemporary water feature. 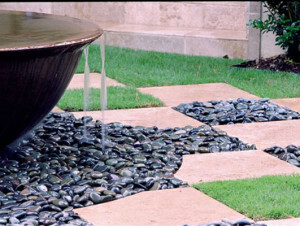 We are showing this in a pondless application which gives it an element of safety. It is a good choice in public or commercial areas. It is made to not only be safe but verily maintenance free. The construction is different than that of a pond. The pond builder has made a large pit filled with rock supported with a grid to make sure there is a open areas of water at the bottom. Then the vase or urn for the fountain is supported on the rock. The pit must be large enough to hold at least two times the volume of the vase or urn. Yes We Offer Pond Construction There Too!